The Cathedral church of Stavanger was started early in the 12th century and completed under the direction of Bishop Reinald between 1125 and 1135. Bishop Reinald is thought to have come from Winchester but, even if he did not, certainly the Cathedrals most important relic, St Swithuns arm, did. It is for this reason that the church is dedicated to "The Holy Trinity and St Swithun of Winchester". The Reformation was used as an excuse to plunder the church by the Danish king; he had the shrine with St Swithuns arm, the 12 or 13 altars, pictures of the saints and the bells removed to be melted down in Copenhagen. The ship sailing to Copenhagen sank off Hastein and the bells are said to lie on the sea bed to this present day giving the name of the spot "Klokkeskjær" or Bell Skerries. In 1272 a fire in the town of Stavanger damaged part of the church. It was rebuilt under the direction of Bishop Arne and essentially reached the form we see today. The nave is the Norman original and a feast to the eyes of those who delight in the detail of Norman architecture. If the Nave is English Norman in style, then the Choir is very reminiscent of Scottish Gothic. Stavanger was of course always a trading port; indeed, the Bishop of Stavanger had at one time his own merchant ships trading with, amongst other places, England. The connection to the British Isles was always significant. One Andrew Smith from Scotland was particularly busy in Stavanger Cathedral producing, in the 17th century, no less than five epitaphs and a sumptuously carved and decorated pulpit. In 1992, the Reil brothers completed a fine classical organ on a new gallery at the West end of the Nave. Its installation necessitated the removal of some of the roof trusses. Fortunately the roof did not suffer from the removal of some of its support but, when it was finished, the Historic Buildings Commission was rather less than happy. Not because the organ looked less than fine  nobody could think that  but it was somewhat larger than they had imagined it was going to be. This had consequences for the Choir organ later on. 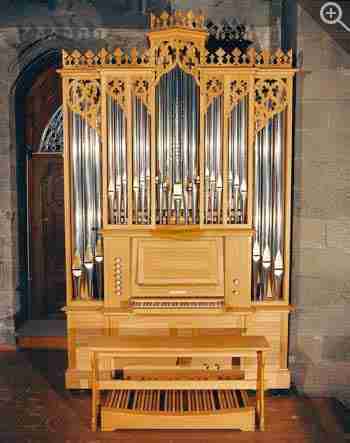 It had always been the intention of the organ committee that, ultimately, Stavanger Cathedral should have two organs. The main West gallery instrument would serve most purposes, but with the distance involved it was not ideal for accompanying the choirs (there are no less than five of them) at the East end of the building, nor did it have the romantic resources necessary for the increasing interest being shown in Norway in the romantic liturgical music of England in particular. So with the completion of the main organ, attention was turned to the acquisition of a Choir organ. The original intention was for a modest instrument of about 12 stops on two manuals, with an as well developed Swell department as could be hoped for within the limitations of size. But the Swell was, in any event, always intended to be rather more than a mere few stops in a box. Proposals were made for an instrument in a suitable Gothic case to complement the architecture of the Choir but the saga of the West organ was too fresh in the minds of the Historic Buildings Commission. It was not keen on an organ in the Choir at all and rejected the initial proposals out of hand. More proposals followed and were also rejected but, finally, certain criteria were set which at least gave us parameters to work to. Except that they were unworkable. 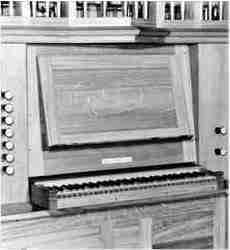 The most significant limiting factor was the height of the organ, which was determined by the lowest edge of the sloping Gothic window ledge in the Choir  too low to enable us to build an instrument with acceptable visual proportions and too low to accommodate the sort of instrument the music demanded. By moving the intended site of the organ slightly further West, it could come down a few steps which would at least give us a little more much needed height. But only one such place could be considered, and that presented a width problem. The organ would have to fit between the "Bishops Door" and the substantial wall of the Chancel arch. This was going to be workable  until the Historic Buildings Commission got involved again. This time it was a depth restriction they wished to place on the organ. The new site was too close to the 17th century Andrew Smith pulpit. The organ must not project more than an absolute maximum of a few centimetres beyond the chancel wall, nor must it be highly decorated or else it will detract from the pulpit itself. Oh yes, and it must be painted a dark grey green to look as much like the stonework as possible. But we were at least given dimensions to work to and they had to be written into the contract. The maximum height was to be 3 metres (9'10"), the width 2.1 metres (6'11"), the depth 1.2 metres (3'11"). It was not to be a fixture, indeed it had to be moveable. It was in fact built on and around a self contained steel chassis with large diameter neoprene wheels. Designing an organ for the accompaniment of the romantic choral literature within these limitations of size was all but impossible. A two-manual scheme was out of the question if there were to be a reasonably sized department under expression. The specification was therefore essentially dictated by the space available to us. 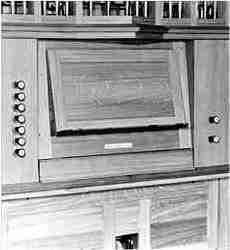 It had to have front pipes, and the possibility of using dummies was not ever considered, so finally an instrument of eight stops was agreed, with all the manual stops excepting the Open Diapason enclosed in a swell box. Having settled the specification, designing the instrument was no easy task. We asked for 50mm more width. The answer came back: No. So we asked for 25mm. Same answer: No. So thicknesses of timber in the organ were shaved by a millimetre here and a millimetre there. The centre tower was made a little more pointed, the Bourdon scaled a note or two smaller, and eventually we achieved our 2.1m maximum width. (Ssh! we didnt count the carving or mouldings in any of the measurements.) 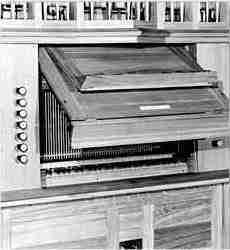 The pedal board was made to be removed especially easily, and the keyboard retracts behind a cover attached to the music desk, as shown in the black and white photographs. Everything was to be made in finest oak, polished and then painted over in grey-green. The idea was that in a few years time when the dust had settled, the paint would be stripped off the case revealing the natural oak. In the end a change in the Historic Buildings Commission enabled common sense to prevail and the oak casework was oiled rather than painted. 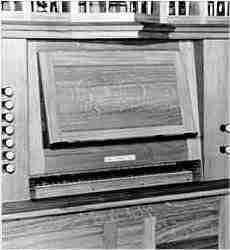 In order to make the organ easier to manage when accompanying the choirs (particularly in the more romantic repertoire), two shifting action pedals were provided, something which seemed to be new to Norwegian organists. By selecting the stops which each pedal put off carefully, a means was found whereby four distinct dynamic levels could be selected at will by operating one, the other or both shifting action pedals together. The voicing is intentionally on the romantic side with blend being important to allow as many differing combinations of stops as possible within the limited choice. The use of the organ also dictated the choice of an Oboe, and its inclusion lends the combination of those stops under expression a surprisingly convincing large Swell effect when used with a choir. The music of Stavanger Cathedral is of more than passing interest and is in fact a trend one sees generally in Norway. Much of the sort of music we associate with Cathedrals and Oxbridge colleges in particular is standard repertoire and sung in English. Sung canticles and responses are so similar to the more traditional Church of England rites that one could almost follow the service in English. Their relatively new hymnal contains almost 1000 hymns (with music so the musical ones who dont know the tune can sing it! ), a large proportion of them from our own hymn books, at least the better ones. One cannot help but wonder. A quick look at the large selection of hymns from all over Europe demonstrated the wealth of excellent material already available. One could be very sparing in writing new hymns for the sake of it and reserve inclusion for the occasional outstanding example. It made the sort of hymnal we find in our own churches these days look very thin and sad. Here they were singing our best hymns and with gusto. "Well trained", said the organist when I remarked on it. "Well motivated", I thought when I looked at the hymn book! It had to be. What congregation of 300-400 have you heard singing a hymn really well during the administration of the Sacrament, led by a one-manual organ of eight stops in the Chancel and even completely unaccompanied whilst the organist takes Communion? For Sunday by Sunday worship, the organ sits in its corner on the South side of the Choir between the Bishop's Door and the wall of the Chancel arch, accompanying the choir (whichever one of the five, or combination of them is singing) in the liturgy and leading the singing for some of the hymns. From here, the organ will also accompany smaller services for modest congregations concentrated at the front of the Nave or in the Choir itself. For concerts it is wheeled out to stand at the top of the Chancel steps where it might accompany a choir, with or without an orchestra, or act as a continuo instrument, a solo instrument with an orchestra or even as an organ in its own right. All of which it was called on to do during the concert to a packed Cathedral on the evening following its dedication. After the concert there was a banquet given for the Organ Committee and others associated with the organ and Stavanger Cathedral. The Dean made a speech in which he drew attention to the similarities in their Norwegian Lutheran Liturgy to our own Anglican tradition. Although Lutheran, this leaning towards English traditions is entirely conscious. It is encouraged by the music staff and the clergy and very clearly commands considerable support from within the congregation. Why Because there is an embracing of new traditions as well as a continuation of the old rather than an abandoning of the old. A refreshing broad mindedness rather than either modern got-to-be-up-to-date dogma or stick-in-the-mud conservatism. Perhaps the most interesting manifestation of the attitude was the presence of a thurible in the Sacristy of this Lutheran Cathedral. Not used very often but there for when it is needed. Working with Stavanger Cathedral proved to be quite an eye-and ear-opener and was an altogether most enjoyable experience. 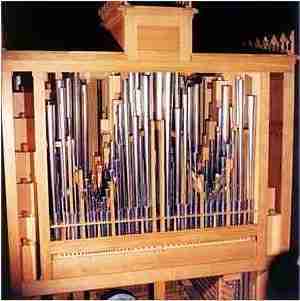 View the Specification of the organ in Stavanger Cathedral (completed 1995) and the pipe scales.